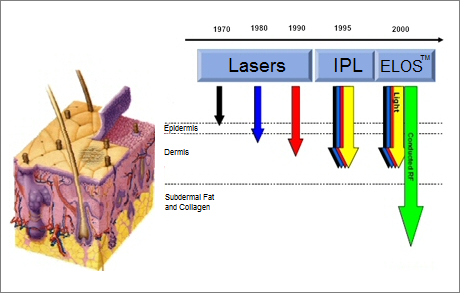 Although lasers were invented in the mid 60s, it wasn’t until the mid 1980s that the technology had evolved enough to be used safely for dermatological applications. In 1991, physicist Dr. Shimon Eckhouse invented and patented intense pulsed light (IPL), a significant advancement over conventional lasers, and for nearly a decade, IPL remained the industry standard for many non-invasive aesthetic procedures. However, limitations on the technology remained, including limited penetration, poor targeting, and risk of epidermal pigmentation changes and scarring. A quantum leap occurred in the year 2000, when master physicist, Dr. Michael Kreindel, combined IPL technology with bipolar radio frequency (RF) to create electro-optical synergy or elōs as it is now known. This revolutionary technology platform soon set new standards in safety and efficacy for a wide range of medical aesthetic procedures. elōs is the first and only technology, that simultaneously harnesses the power of bi-polar radio frequency (RF) and optical energy (either laser or light). Developed by IPL inventor/patent-holder Dr. Shimon Eckhouse and master physicist, Dr. Michael Kreindel. This revolutionary technology platform effectively overcomes the safety and procedural limitations of intense pulse light (IPL) and conventional lasers. The elōs advantages in safety and efficacy are documented in over 40 Clinical Papers and realized in medical aesthetic practices around the globe. The eStyle is a dermatological system based on the combination of two different types of energy – optical (light) and radio frequency (RF). Both these energies compliment each other, and together they provide selective thermolysis to a variety of biological targets. While the optical energy is absorbed by the relevant chromophores, the RF energy primarily affects the part of tissue having higher electrical conductivity. The use of both forms of energy provides enhanced selectivity by double targeting, enhanced safety by using less optical energy and enhanced efficacy by using high overall energy. Traditional light sources have long been used for photothermolysis of targets in the skin. Hair removal, pigmented lesion removal, vascular lesion removal, nonablative skin rejuvenation or dermal remodeling are examples of indications that are successfully treated by a variety of wavelengths and filtered spectrum light. 1. Not enough light energy absorbed by the target means less efficacy. 2. Too much light energy absorbed by non-target tissue means collateral damage or unwanted side effects, usually to the epidermis or dermis. ELOS presents a solution for both problems; since the light and the RF play equal but different roles in the formula, by reducing one and increasing the other, efficacy will not be compromised for safety, and safety will not be compromised for efficacy. Pulsed Light is selectively absorbed by the target and is converted to thermal energy, resulting in targets heated to a higher temperature. The objective is to heat the target (hair follicle, acne, vascular or pigmented lesion, or collagen fibers), which will lower the impedance or resistance of that target. RF Current flows from one electrode to another, and will gently heat everything in its pathway. RF current, like all other electrical energies, will travel along the path of higher conductivity or least resistance. When targets are pre-heated by the pulsed light, they have lowered impedance or low resistance. The RF current density will be higher in those areas of lower impedance (pre-heated targets), resulting in further thermal injury to the target. This completes the thermolysis impact that is necessary for the desired biologic effect – such as follicles to stop growing hair, or vascular and pigmented lesions to fade. At the same time, the epidermis is chilled by the cooled applicator tip and its impedance rises. This results in less RF current flowing through the epidermis for enhanced safety, and in penetration of the electrical current into the deeper and pre-heated areas in the skin. In addition to contributing to thermolysis of dermal targets, the RF current also acts as an indirect “thermometer” in the dermis. During the application of RF energy, the device measures changes in the skin’s impedance. There is an inverse relationship between changes in temperature and impedance; rising temperature correlates with a drop in impedance. This allows the eStyle to perform active dermal monitoring for hair removal and skin rejuvenation applications, offering the user a “smart” device with a unique safety mechanism. The system’s treatment parameters are set according to clinical indications, in order to achieve maximum safety and efficacy for each patient. The system provides a safety mechanism that monitors energy impact to the tissue in real-time. An additional safety feature of the system is the contact cooling mechanism in the applicator – this provides epidermal protection prior to energy delivery.